NEO is a non-profit, community-based blockchain project. It is a distributed network that uses blockchain technology and digital identity for asset digitization. It is also an intelligent management of digital assets using intelligent contracts to create “Smart Economy”. At present, NEO’s market capitalization ranks fifteenth in the world in coinmarket, being one of the remarkable blockchain projects. We found a Denial of Service vulnerability in the NEO smart contract platform which attacker could use to instantly crash the entire neo network. The general idea is: when the contract calls the System.Runtime.Serialize, it will pop out the first element (parameter StackItem item) on the virtual machine stack, then serialize it with function StackItemItem and write it to the binarywriter writer. SerializeStackItem cheks the element type and then performs a corresponding serialization operation. There are many types of StackItem. If it is an array, the array size and child elements will all be serialized again. The array here is customized defined by NEO. Originally, it is a List. One scenario is not took into consideration here that an attacker might add array a as a child element to array a, i.e., a.Add(a). If you de-serialize a at this time, you will enter an infinite loop, until the program stack space is exhausted and triggers stack overflow exception (StackOverflowException). 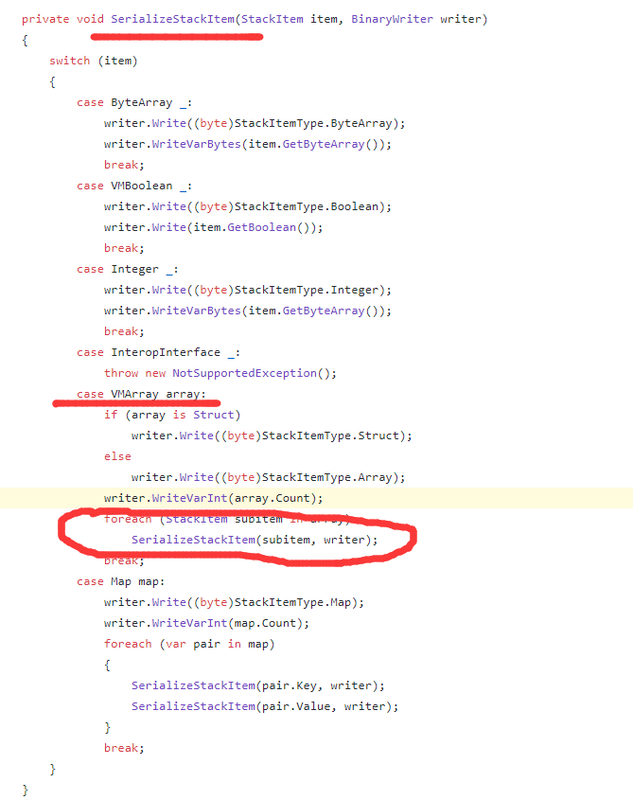 However, the exception catch cannot handle the StackOverflowException. 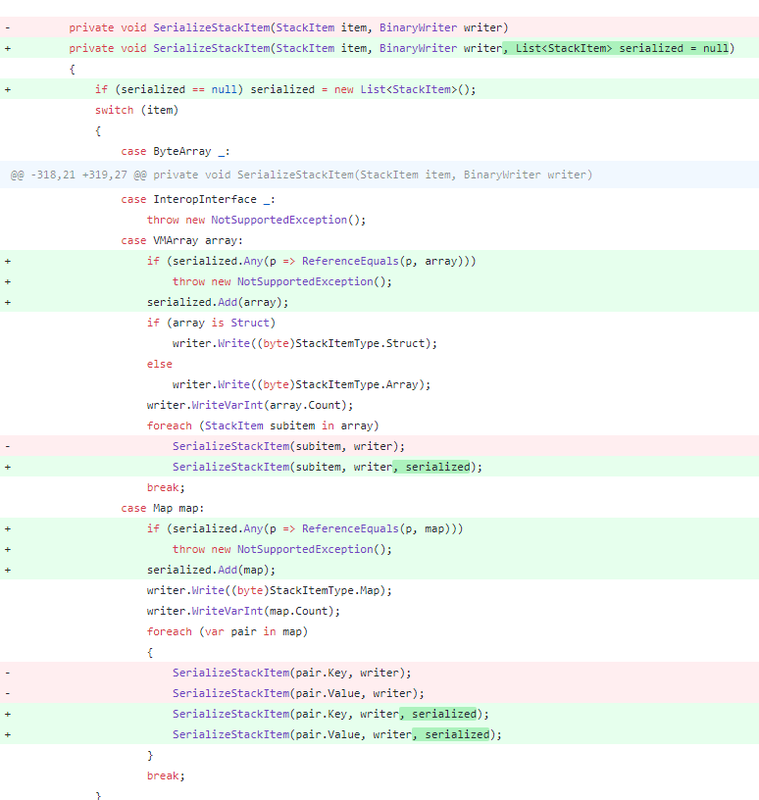 A StackOverflowException in .net will cause the entire process to exit and fail to catch the exception. This in turn causes the entire neo node process to crash directly. Attack virtual machine commands: push(a), dup(), dup(), appen(), System.Runtime.Serialize() can cause a stack overflow exception and the program will crash directly. [Similarly, the stuct structure and map structure can also use this vulnerability].